Wintertime when I was small they used to dance so much…They did them for fun so they don’t forget them. Some used to wear masks but after white people came around here they cleaned out all the masks. Too bad I didn’t learn the songs. Pulling the strings on this Sparrow Hawk mask makes the eyes move, the beak open, and the tongue rise and fall. 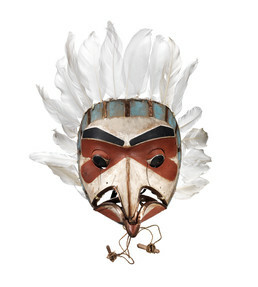 Haida dance masks were worn during winter “secret society” ceremonies for the acquisition of supernatural power, and often represented ravens, hawks, puffins, oystercatchers, and other birds. The mask is brightened with strips of copper.